So let’s be really clear about something: The Republicans’ scheme to defund Planned Parenthood isn’t some sort of surprised response to highly edited videos. Let’s call out the Republican vote to defund Planned Parenthood on Monday for exactly what it is: Another piece of a deliberate, methodical, orchestrated right-wing attack on women’s rights. And I’m sick and tired of it. Join me in telling the Republicans: Shame on you for playing games with women’s health. Defunding Planned Parenthood is a big deal. Whatever your age, wherever you live, I guarantee that you know someone who has used a Planned Parenthood health center. No one may mention it at Thanksgiving dinner or post it on Facebook, but look at the facts: One in five women in America is a Planned Parenthood patient at least once in her life. Every single year, nearly 2.7 million people show up for help at Planned Parenthood. Why do so many people use Planned Parenthood? Because they are nonprofit doctors’ offices – more than half are in rural or medically underserved areas. Young people go to Planned Parenthood for birth control. Women who can’t get appointments anywhere else go to Planned Parenthood for affordable Pap tests and cancer screenings. Couples go to Planned Parenthood for STD treatments or pregnancy tests. And yes, 3% of patients visit Planned Parenthood for a safe and legal abortion with a doctor who will show compassion and care for a woman who is making one of the most difficult decisions of her life. Rand Paul and Ted Cruz may think it’s fun to play politics with these people to score points with presidential primary voters, but this isn’t a game. This is about cancer. This is about HIV. This is about birth control. This is about access to basic medical care. The Republican plan to defund Planned Parenthood is a Republican plan to defund women’s health care. Join me now to say enough is enough. I stand with Planned Parenthood. I fight for my daughter, for my granddaughters, and for people all across Massachusetts and all across this country. 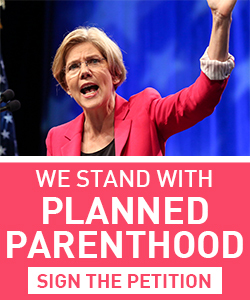 We cannot let the Senate Republicans defund Planned Parenthood.